I Want My Name Removed! I’ve had a few friends ask about the process I went through to leave the church, so for easy access and your advantage I’ll tell you. I’ve heard horror stories of people trying to leave the church before. The church will tell you no or they’ll demand additional things or even tell you you have to go through a church court to be excommunicated or something like that… The truth is you don’t need to do anything but express your wish to leave. Legally they are an organization and you are free to leave at any time. You do not need to be there. Why should you ask to have your information removed from church records? For me it was a cathartic means to an end. I also no longer would have random people contacting me from the church, I wouldn’t have the missionaries stopping over (even though before I even came out that I wanted to leave the church they told the missionaries to stop coming). Basically the church no longer had a hold on me and I wanted to be as far removed from them as possible. When I figured out the truth and history of the church I was so angry and hurt that I’d dedicated my life to them that I couldn’t even stand the sound or sight of the LDS church. I wanted to run into the church building and tell everyone what I knew. I wanted to get up on the stage on Fast Testimony Sunday and tell everyone that Joseph Smith was a liar and this is how I knew… So to throw it in the church’s face literally I decided it was time for me to remove my name from the fake number of 15 million members. 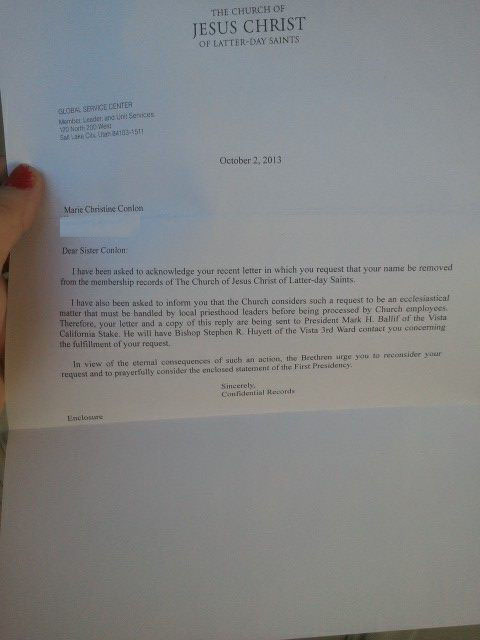 My first letter: I actually emailed the church. For months I’d been trying to write a letter to send in the actual mail, but one night my anger got the better of me and I just emailed it. It was quick, painless, and actually worked… And I didn’t have to waste a stamp. ***Record Number (You don’t have to if you don’t know it. This letter is my formal resignation from the Church of Jesus Christ of Latter-day Saints and it is effective immediately. I hereby withdraw my consent to being treated as a member and I withdraw my consent to being subject to church rules, policies, beliefs and ‘discipline’. As I am no longer a member, I want my name permanently and completely removed from the membership rolls of the church. My resignation should be processed immediately, without any ‘waiting periods’. I am not going to be dissuaded and I am not going to change my mind. 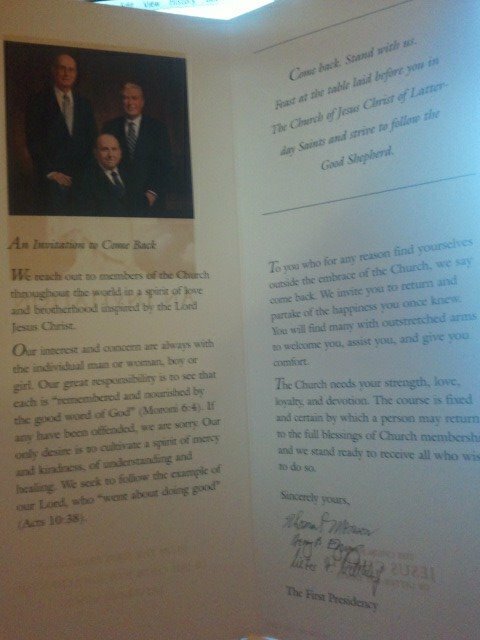 After sending this letter I received a letter in the mail from the LDS church. I have been asked to acknowledge your recent letter in which you requested that your name be removed from the membership records of The Church of Jesus Christ of Latter-day Saints. I have also been asked to inform you that the Church considers such a request to be an ecclesiastical matter that must be handled by local priesthood leaders before being processed by Church employees. Therefore, your letter and a copy of this reply are being sent to President (Stake President) of the (Stake I’m in). He will have Bishop (brand new bishop) of the (ward I’m in) Ward contact you concerning the fulfillment of your request. In view of the eternal consequences of such an action, the Brethren urge you to reconsider your request and to prayerfully consider the enclosed statement of the First Presidency. Well I’d been warned by other former members that this might happen. My advice to you, if you really want to get out of the church – BE PROACTIVE!!! Do whatever you’ve got to do to make sure the church holds up their side of this deal. Don’t wait for the church to come to you. They never will. Remember, they need your membership. They’re hoping that all the red tape will make you annoyed or disheartened and just give up. They’re counting on that! That’s how their membership which says 15 million is actually closer to 5 million. There are over 10 million members who have left the church but never officially resign!! Stop being counted as one of their ever growing bunch!!! The LDS Church membership is dropping at a record pace they don’t know what to do! Why do you think they’re currently posting everything they can about the awkward history of the LDS Church right now? Because people are finding out the truth AND LEAVING!!! And it’s not just a couple thousand, it’s millions! The truth is coming out. Thomas S. Monson is currently being taken to court for fraud!! I’m telling all of you the truth!!! This Church is a bunch of LIES!!!! Anyway, back to what to do next now that you’ve got this letter. Be proactive. I went onto the LDS.Org website and looked up the ward I was in according the my address. They list the bishop and counselors contact information along with the stake president. Both my bishop and my stake president just so happened to have their email addresses listed so I emailed them both a copy of the first email I sent to the LDS Membership Records. I also CC’d the membership records. 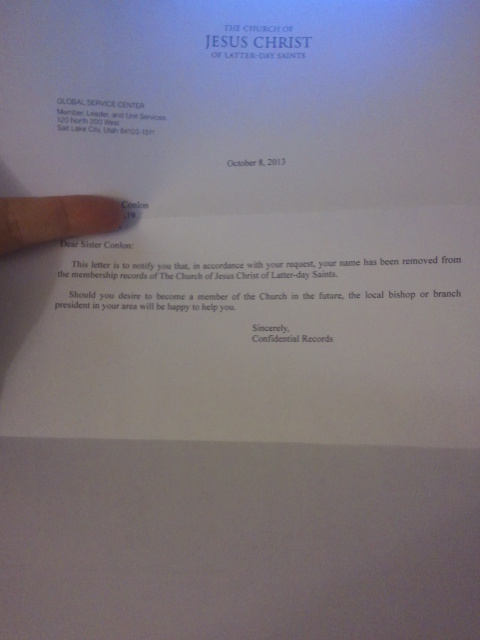 As I’m sure you’ve been made aware by the Church Membership Records department, my request was received on October 2, 2013 and acknowledged. I was informed that you would have to do your part in signing paperwork and sending it in. No further action was to be done on my end. Once this letter of resignation was received by the Church, my resignation was complete. This email constitutes as a legal, binding document per the Electronic Signatures In Global and National Commerce Act. Please complete your process and send in the documentation for my removal. If my request continues to be delayed I will involve my attorney and press for legal action. I went ahead and submitted your request and attached the unsigned email. President [name] just texted me that he completed his part of the process. When I hear from Salt Lake, I will let you know. Notice how I’m starting to become annoying? Yeah, he thought I’d just give up… Didn’t happen. Your name has been removed from church records, as you requested. To maintain confidentiality only the principal ward leaders will be notified. This should ensure that you will not be contacted by home teachers, visiting teachers or any others in an official capacity. I believe you already know that should you want to fellowship with us again, you will be welcome. Furthermore, the way is open for your baptism and restoration of blessings. In all likelihood I will be the bishop in this area for many years. If there is anything I can ever do for you, you have only to ask. I do not know if additional confirmation of this change will be sent from Church Headquarters. I asked President [Name], but he didn’t know either. As far as I can tell from the handbook, it is my responsibility to notify you. That is why I emailed you as soon as I noticed your name was deleted from the ward roster by Salt Lake. It seemed rather abrupt, but then, that was your request. A few days later my official letter came, post marked on October 8th, the same day he told me he submitted it. Entry filed under: Blessings, christ, faith, family history, god, heavenly father, How-To, LDS, mormon, priesthood, scriptures, temple, temple work. Tags: Book of Mormon, ex-mormon, false, getting out, lds false, leaving, leaving the church, left, left the church, lies, mormon, mormon false, Mormons, the church is false. Good for you. happy for you. I resigned by email as well, got the “ecclesiastical” letter and the cheezy pamphlet, local “bishop” wanted to meet with me and I declined. Evidently piqued by that, he sat on everything and did not send in the Report of Administrative Action. I called Member Records and they called the bishop and left a message. He did not return their call and the next time I phoned Member Records they informed me of that and told me that they would process my resignation whether or not the bishop got back to them. 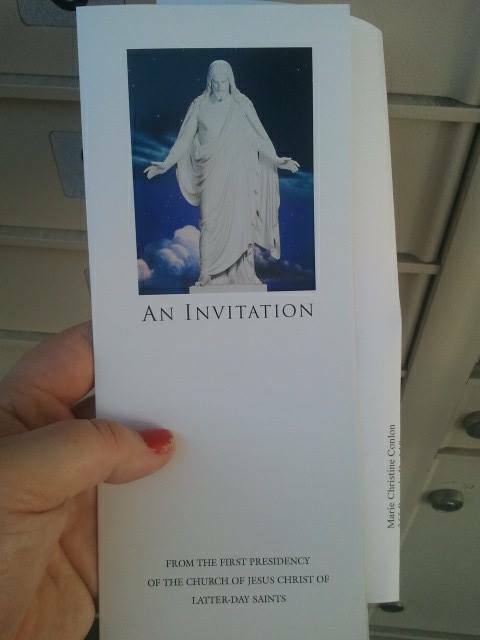 Sure enough, my letter of confirmation showed up. On Christmas Eve. I desperately hope you find the truth you are looking for. To find out for yourself us the only way to really know what you believe. Your blog name confuses me though.